Sicily’s Verdura Resort continues to push the boundaries for golfing excellence after receiving a leading international honour from the world’s biggest golf media title for the fourth successive year. Home of the Rocco Forte Sicilian Open and renowned for offering guests the ultimate luxury golf experience, the exclusive resort was again selected by Golf Digest magazine as a recipient of its prized ‘2019 Editors’ Choice Award for the Best Resorts in Continental Europe’. Unveiled in the new issue of Golf Digest, the list features an elite collection of top names from the global golf industry, and was compiled after close consultation with a combination of the magazine’s group of international affiliate titles and 1,000-plus golf-course raters. 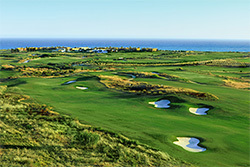 Opened in 2009, Verdura Resort – a Rocco Forte hotel and a member of the European Tour Properties network – is firmly established among Europe’s elite golf resorts, and further enhanced its repuation earlier this month by becoming the first golf venue in Italy to open a European Tour Performance Institute. Only the third facility of its kind in the world, professionals and amateurs have the unique opportunity to practice, learn and improve under sunny Sicilian skies using tools and techniques developed by the European Tour’s medical and performance specialists. Antonio Castelo, Golf Director at Verdura Resort, said: “Like all our golfing guests, the resort is always looking at ways that we can improve and this new global accolade recognises all the hard work that has been put in to make Verdura one of the world’s leading golf and lifestyle destinations. Set in 230 hectares of stunning Mediterranean landscape on Sicily’s southern coast, Verdura Resort’s golf facilities include two outstanding 18-hole championship course and a par-three nine-hole executive course – both designed by world-acclaimed architect Kyle Phillips – a double-ended driving range and a first-class academy. One of the 18-hole courses is currently being revamped to offer guests a new and enhanced experience. Located between Agrigento and the charming fishing town of Sciacca, an 80-minute drive from Trapani and Palermo airports, Verdura Resort features 203 rooms and suites, all with a sea view, including six villas which offer a perfect solution for family holidays, each with its own private swimming pool. Verdura features 203 rooms, suites and villas all with sea views, and is a paradise for golfers with its outstanding facilities. Players from all over the world come to enjoy the two 18-hole championship courses and nine-hole par-three course. The links-style layouts have all been designed by world-renowned golf architect Kyle Phillips and are built to the highest specifications, while one of the 18-hole courses is currently being revamped to offer guests a new and enhanced experience. A member of the exclusive European Tour Destinations network, Verdura was the host venue for the 2012 Sicilian Open and is home to the European Tour’s Rocco Forte Sicilian Open. The courses are matched by outstanding practice amenities including a double-ended driving range and excellent golf academy and Performance Institute. Verdura Resort has received widespread international recognition and won numerous awards since opening. Among its most recent honours, it was ranked top in Italy and sixth in Golf World’s updated list of the ‘Top 100 Golf Resorts in Continental Europe’, second in National Club Golfer magazine’s inaugural list of the ‘Top 100 Golf Resorts in Continental Europe’, and named by Golf Digest as a recipient of an ‘Editors’ Choice Award for Best International Resorts’ in 2016, 2017, 2017 and 2019. In addition, the resort won the title of ‘Italy’s Best Golf Hotel’ at the 2015 World Golf Awards’; retained its place in Golf World’s benchmark ‘Top 100 Courses in Continental Europe 2017/18’ rankings and claimed a ‘Golden Award for Golf’ at the 2015 Voyages & Hôtels Readers Awards. It was also the only Italian resort to be named in Conde Nast Traveller magazine’s list of ‘The 14 Best Family Hotels in the World’ in 2018 and ‘Best Family European Golf Resort‘ by the 2011 Tatler Travel Guide, while it was the recipient of two accolades at the 2015 Spafinder Wellness Travel Awards in the ‘Best for Couples’ and ‘Wow Factor’ categories. Established by Sir Rocco Forte and sister, Olga Polizzi in 1996, Rocco Forte Hotels is a collection of 10 individual hotels and resorts. All of the hotels are landmarks, both old and new, occupying magnificent buildings in exceptional locations. Led by a family who has been in hospitality for four generations, the hotels are united by their distinctive approach to service ensuring guests experience the best of the cities and surrounding areas.